Shannon Long talks with her 4-year-old daughter, Hope, after having lunch with her extended family in West Paris, Maine. Long is six months into recovery from an addiction to heroin and opioids. She started abusing pills as a teenager in her rural Maine town. 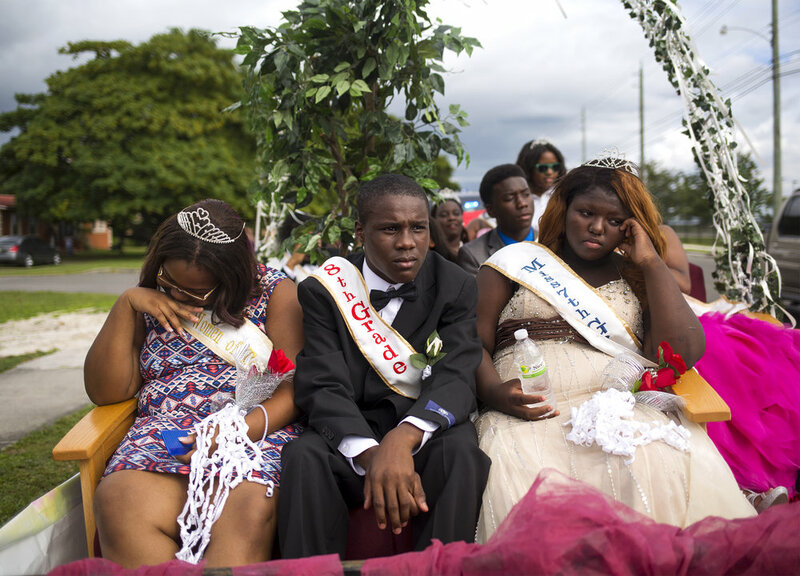 A group of middle school students wait on their float for the homecoming parade to begin in Pahokee, Florida. Grace Connolly waits for her cue to start her performance to Shania Twain's, "Man, I Feel Like a Woman" as her drag persona "Bologna Rosé" during Deering High School’s annual Gender Sexuality Alliance drag show in Portland, Maine. Connolly, a senior at Deering, said that the show is the first time she has been in drag outside of her house and that she became interested in drag after learning about queer history and the gay liberation movement. "Freshman year here, this would not have been a thing," Connolly said. A football player celebrates in a huddle after a playoff game win in Wells, Maine. Veterans’ Day Parade. Biddeford, Maine. Donald Trump illuminated by bright stage lights at a campaign rally in Bangor, Maine. Trump campaigned hard in the second district of the state and went on the win it in the election, splitting Maine's electoral votes for the first time in state history. Lawerence Alston, 17, cries on the shoulder of a friend during the wake of his best friend Johnny Taylor Davis Jr. who was killed in a drive-by shooting in his North West Palm Beach neighborhood. Davis' neighborhood, which is just a few miles away from Trump's winter home Mar-a-Lago, was ravaged by gun violence over the summer of 2015. Overall, ten people were killed at 28 were wounded. Women prepare for their turn on stage at the Florida NPC Gold Cup Bikini Open in West Palm Beach, Florida. A woman walks through a park in Portland, Maine during a strong winter nor'easter. Mikey O'Hara-Damon, 8, jumps from couch to couch in the living room of while Makayla's nurse Robin checks on her. Makayla and Mikey live with their grandmother Deborah Damon at her home in Owls Head, Maine. They are both the children of Deborah’s eldest son. Makayla came to live with Deborah when she was 2 years old and her parents rights were terminated because of opioid addiction. Makayla has cerebral palsy, a host of other medical issues and suffers from serious seizures, she needs round-the-clock care. Mikey, who was born drug affected, came to her at nine days old. They siblings are two of six children taken away from their parents. Friday night at the Vets Club. Valentine, Nebraska. Senior Whitney Coro dances with her boyfriend Gavin Beard after she was crowned prom queen during Carrabec High School's prom at T&b Celebration Center in Skowhegan, Maine. A crowd watches as Corey Jones' casket is carried into Payne AME Chapel at his funeral in West Palm Beach. Jones was shot and killed by former Officer Nouman Raja while he was waiting for a tow truck on the side of on the interstate on Oct. 18, 2015. A man waits in his car for a pro-confederate flag rally to start in Virgina Beach. Rabbi Moshe Wilansky leads his family on the search for chametz in their home on the night before the start of Passover in Portland, Maine. Community members stand alongside the road to pay their respects as Capt. 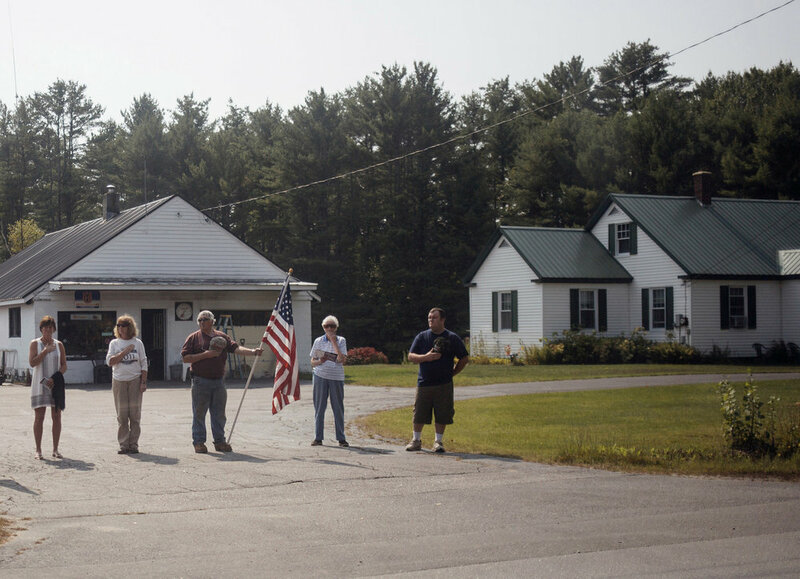 Ben Cross' funeral procession makes its way to Riverside Cemetery in Bethel, Maine. Cross, a 26-year-old Bethel native, was among three Marines killed in August when their MV-22 Osprey crashed into the Coral Sea. His body came home over a month later and hundreds of community members came out to honor him. Ferris wheel at the Clinton Lions Fair. Clinton, Maine.